SandMat - Lake Weed Killer, Removal, and Control - Good Bye to Muck & Weeds! The SandMat is a great solution for lakefront owners to create a beautiful sandy beach area between their grass and the deeper parts of the lake. It works by killing all lake weeds and preventing them from growing through the sand, and it prevents the sand from sinking and mixing with the dark soil of the lake front swimming area. It creates a barrier between the lake bottom and your sand. So just install the SandMats in the area where you want to place your sand and then dump the sand over it. Easy. The material is DNR-approved, lasts virtually forever, and is gas-permeable, (plastic tarps don’t work well, they trap gasses underneath, bubble up and sand slides off easily). It will greatly reduce the number of sandbags needed to create the sand beach area too. And for your ease of mind, we guarantee our SandMats for five years against defects in materials and workmanship. It takes work to make a sand beach on an inland lake. You want it to last as long as possible. To make your new beach last, you need a base to keep it separated from silty lake bottom soils. If you’re putting sand over muck — you definitely need a barrier to keep your sand from sinking. SandMats & Super SandMats will do just that. 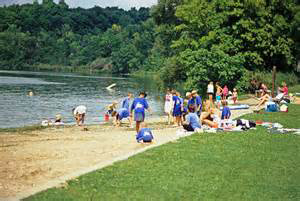 A sand beach is a great addition to your lake. Do it right the first time. Putting a border between your lawn and sand creates a barrier that slows erosion from rain and snow runoff. Sand, on a mucky lake bottom, doesn’t last long. 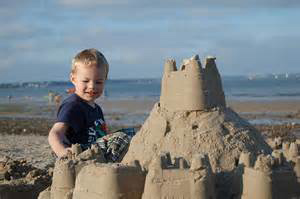 Your sand is heavy — it sinks quickly in the soft soil — because sand is heavier than silty muck. 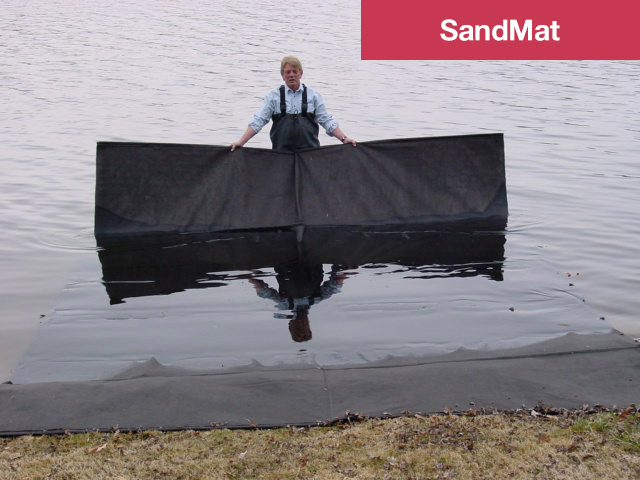 SandMat keeps your sand from sinking, drifting, shifting and mixing with lake bottom muck. SandMats and Super SandMats provide excellent support for your sand — gives you great “soil separation” and suppress weed growth — both in the water and on shore. SandMat is made for shorelines and firm lake bottoms. As a base for sand, it creates a “separation barrier,” keeping your sand from mixing with lake bottom silt. SandMats control lake weed growth and hinder new lakes weeds from taking root, keeping your sandy beach weed free. They provide excellent soil separation and a good solid base. SandMats are best used as a base on shore, or from shore into shallow water. 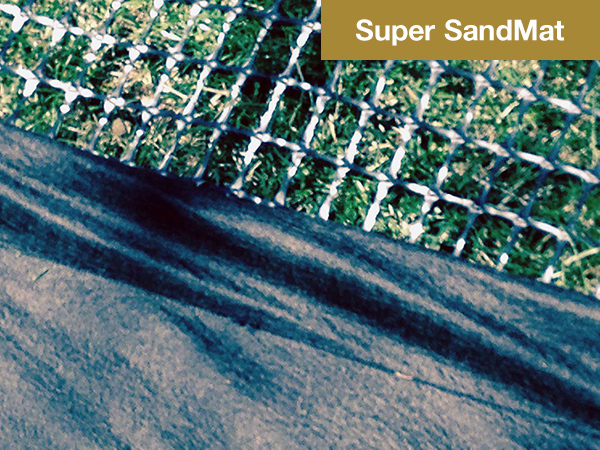 Super SandMat is a “souped up” SandMat, providing extra support for mucky lake bottoms. It works like a giant snowshoe. Super SandMat adds a grid under a SandMat. This extra support keeps you and your sand out of the muck. Super SandMat does everything a SandMat does — plus provides the additional base support for sand on soft, lake bottoms — near shore. The grid lays on the lake bottom, the fabric lays on the grid — you place the sand on top of the fabric to create a firm base and provide excellent soil separation. Pictured is the Super SandMat fabric and grid. You assemble them onshore and place them in your lake together. SandMat and Super SandMat are held down ONLY by sand placed on top — They have no weights or frames. We provide plastic stakes to temporarily hold them in place — they do not stay down on their own — you must add sand. (Most people use 3 to 8 inches of sand or gravel). If you think you may want something with a frame you can also sand to, especially in deeper water, (over 2 feet) over very soft muck — take a look at MuckMat Pro. You can put sand on a MuckMat Pro just same as a Super SandMat — and it’s easy to work with in deeper water because the frame holds it in place on the lake bottom while you put sand on it. A MuckMat Pro is a Super SandMat with a rigid aluminized, steel frame. SandMat and Super SandMat are the best base and soil separation you can get. The material lasts virtually forever, it’s water and gas-permeable — so it rarely bubbles, (plastic tarps don’t work, they trap gasses, bubble up and your sand slides off). 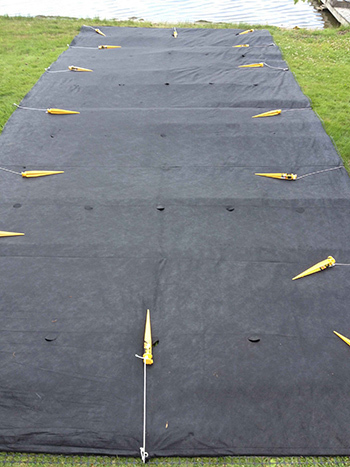 SandMats & Super SandMats come with plastic stakes to help hold them in place on the lake bottom while sand is added.